The Arctic is one of the last expanses of the world ocean that has escaped the increasing din of shipping traffic over the past fifty years, but this respite may soon be ending. China and Russia are rapidly ramping up plans to take advantage of retreating sea ice along the northern coast of Siberia, opening up a new sea route from China to Europe that is significantly shorter than traveling through the Panama or Suez Canals. Meanwhile, the Canadian and Inuit governments have designated a large National Marine Conservation Area in Lancaster Sound, smack dab in the middle of the North-West Passage, which is similarly ripe for increased shipping in the coming decades. 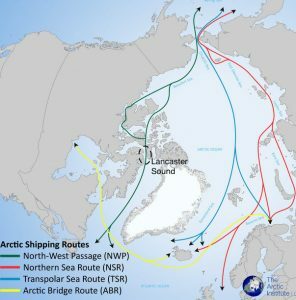 The so-called Northern Sea Route (or Northeast Passage) will benefit from Russia’s fleet of forty icebreakers and eleven Arctic ports; by contrast, there are no Arctic ports on the US/Canadian coastline (one deep in Hudson Bay closed last year). Rob Heubert, a former member of Canada’s Polar Commission, notes that “The Chinese are taking the long view and they’re building ships, icebreakers, and ports to capitalize on the future, which may not be as far off as many think.” Maine Senator Angus King is championing an “Arctic” port in Portland, Maine to become the first US landing point for this increased Asian shipping traffic. Some Russian observers suggest that the country’s investment in ports and icebreakers is a “money-losing… Soviet-style undertaking” that is bound to fail, with the port fees necessary to pay for this infrastructure likely to drive ships outside Russian territorial waters into the Transpolar Sea Route as that becomes accessible. Nonetheless, last week a Russian natural gas tanker made the fastest-ever transit of the Northern Sea Route, traveling for the first time without an ice breaker (the ship was designed to do some ice-breaking on its own). Wherever and whenever Arctic sea lanes open up consistently enough to spur rapid increases in annual transits, it will be crucial to direct the traffic in ways that minimize the impact on relatively pristine arctic soundscapes. To this end, both the Canadian Coast Guard and the Pew Charitable Trusts have been working toward management of the North-West Passage; see this earlier AEI coverage. The new Marine Conservation Area will preclude oil and gas development and seabed mining, but will not stop ship traffic. Lancaster Sound, now to be known by its Inuit name Tallurutiup Imanga, has been called the Serengeti of the Arctic thanks to its concentration of wildlife, especially narwhals, belugas, and polar bears. (Check out this image and video gallery!) In 2009, the Inuit sued the Canadian government to stop plans for seismic surveys in the area, beginning the process that culminated in the recent plan for joint management of these precious waters. Jackie Dawson, a University of Ottowa environmental geographer, is working with Inuit communities to identify ecologically and culturally significant areas, with hopes to designate “no go” and “go slow” zones to reduce sonic intrusions and the risk of ship strikes. This is exactly the kind of work we need to see across the polar regions, before the ice melts enough to change Arctic soundscapes forever.